Multi sports modes like walking, running, cycling, rope-jumping, basketball, badminton and football, choose sports mode and do it, the bracelet will record your heart rate, calories and time consumption then you can check the sports data on APP so as to adjust the intensity properly according to the analysis. Great supervisor for sports enthusiast and those who wants to lose weight or build up body. Walking, running, cycling, rope-jumping, basketball, badminton and football, choose one mode and do it, the bracelet will record your heart rate, calories and time consumption and check more sports data on APP so as to adjust the intensity properly according to the analysis. Built-in 170mAh rechargeable battery, about 10 days ultra long standby time after 2 hours full charged for lasting sports experience. 1.3inch IPS display with 240*240 pixel for clear view, colored icons evoke the passion of sports and touch-control for convenient operation. 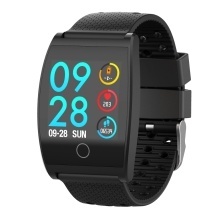 Universal functions like: viewing message, heart rate, blood pressure, blood oxygen test and sleeping monitor, sedentary reminder, alarm clock, stopwatch, camera and music remote control. Supports: English, Korean, German, Japanese, Spanish, French, Russian,Arabic, Ukrainian and Chinese.